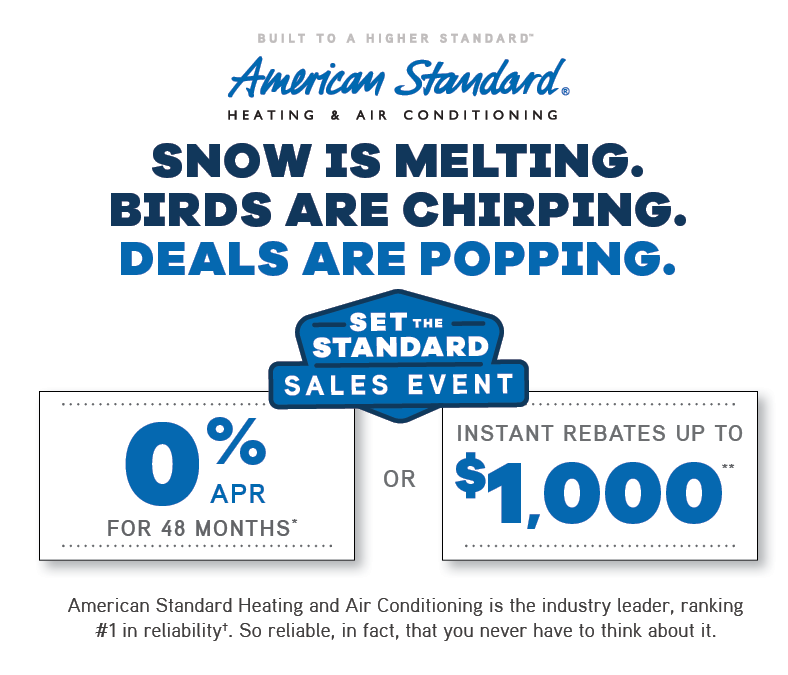 Purchase a new Qualifying American Standard System and take advantage of up to 48 Months Special Financing. Discounts up to $1000 when you purchase certain “Qualifying Equipment”. (Call us to find out what equipment will get you the largest discount). If you need a new Air Conditioner, it is worth a call to our office for all the details about this offer (i.e. qualifying equipment) for this Set the Standard Sales Event! All good things must come to an end! This promotion runs from January 1, 2019 to June 15, 2019. *See your independent American Standard Dealer for complete program eligibility, dates, details and restrictions. Special financing offers or rebates up to $1,000 valid on Qualifying Equipment only. Offers vary by equipment. All sales must be to homeowners in the United States. Void where prohibited. **The Wells Fargo Home Projects® credit card is issued by Wells Fargo Bank, N.A., an Equal Housing Lender. Special terms apply to qualifying purchases charged with approved credit. The special terms APR will continue to apply until all qualifying purchases are paid in full. The monthly payment for this purchase will be the amount that will pay for the purchase in full in equal payments during the promotional (special terms) period. The APR for Purchases will apply to certain fees such as a late payment fee or if you use the card for other transactions. For new accounts, the APR for Purchases is 28.99%. If you are charged interest in any billing cycle, the minimum interest charge will be $1.00. This information is accurate as of 1/1/2019 and is subject to change. For current information, call us at 1-800-431-5921. Offer expires June 15th, 2019. †In July 2016, readers of a national product testing and research magazine rated American Standard Heating & Air Conditioning’s air conditioners and heat pumps as the most reliable brand among leading manufacturers. Purchase a new Qualifying RUUD AC System and take advantage of 0% financing for up to 60 months with approved credit. ParkerAire, helping you keep your cool! Call us today for all the details and the list of qualifying equipment! ParkerAire has been a fully licensed contractor in the state of Florida since 2005. When you allow ParkerAire to perform work on your air conditioning system, you can rest assured we are adhering to the highest industry standards to help extend the life of your system. 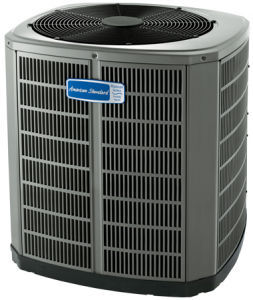 ParkerAire has over 50 years of experience working with air conditioning systems of nearly any make or model. We provide installation, maintenance and repair services for both residential and commercial systems. ParkerAire is renowned for our exceptional workmanship and customer commitment. Our technicians have done it all, from small repairs to large system installations, and they understand the appropriate steps that must be taken to provide our customers with the best results.